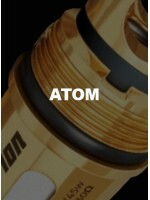 .4ohm Clapton Coils for Subxero TankAtom OVC coils feature 100% organic cotton wicking, 2 gauge in a..
Atom gClapton OVC (Organic Vertical Clapton) coils are the new standard in vaping. Clapton coil buil.. If you’re a vaping rock star you’ll love the new gClapton OVC (Organic Vertical Clapton) coils. We’v..